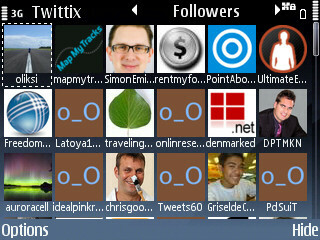 In the series on Best Tweeting Experiences for Nokia E71 we’ve been having a look at Gravity from Mobileways.de so far. Gravity seems by many to be the king of twittering on S60-based mobile devices including the Nokia E71. As in all stories involving a king you usually also have someone out to get the king’s crown and the kingdom of S60-Twitterers. In our story, the most likely contender at the moment among paid Twitter clients seems to be Twittix from Viking Informatics, sold and marketed by Mojosmobile.com. Now, Twittix is a native S60 client for Twitter. It costs about €5 and brings you all the things you’d expect from one of the top two applications in the market: timeline, tweeting, replying, direct messages, My Tweets, people you follow, followers, etc. In my last post on this topic I said that Gravity has set the bar, so naturally we will be comparing Twittix to Gravity. In the following I will focus less on what these two great applications have in common and a lot on what makes them different from eachother. Twittix packs a few features that Gravity doesn’t which changes the user experience a bit. You can forward tweets via sms, which means that you can share interesting tweets or just your own tweets with anyone with a mobile phone – you’re no longer bound by who’s on Twitter. Personally I’m a big fan of breaking down barriers like that so this is a definite plus for Twittix and something Mobileways should seriously consider implementing in Gravity. With Gravity you can see how many followers and how many following a profile has. Twittix takes it further and lets you view profile and even browse who is followed and who is following. Smart feature which makes Twittix a stronger tool for finding new connections. In addition you can pick any profile and introduce that person to anyone currently following you. This too is a plus point for Twittix. Twittix has other features which Gravity is missing, but the above features are the ones that in my mind makes Twittix more than just a “wannabe Gravity”. Twittix is missing some features too, though. One major missing feature is the ability to create and store multiple Twitter searches. That feature makes it possible for you to not just use Twitter as a social engine, but also as a knowledge engine. Twittix is missing literally endless searches and Twitter trends – two features which are much more about what is going on than who it is going on with. Twittix does have one search and more on this front is coming in version 1.01, but at this point it’s just not enough for content focused users. Essentially this is what it’s going to come down to for many users: What kind of Twitter user am I? Am I a user-focused Twitterer or am I a content focused Twitterer. Many user focused and social twitterers will choose Twittix for its ability to stay in touch with people and connect people to other people – including connecting themselves to all of those people. Content focused users should stick to Gravity for its access to a wealth of information about things that interest you regardless of who it’s coming from. If I were to come up with a tagline for Twittix it would be “The Social Twitter client”. With both clients it’s a bit of a give and take and both are excellent software products. You have to make up your own mind, but for me the graphics of Gravity, the many searches you can make along with the ability you do have to stay up to date with people still makes Gravity my Twitter tool of choice – even at €5 more than Twittix. The look and feel of Twittix is not polished enough for me – very subjective, I know, but that’s my opinion. All that said, it looks like Twittix is carving a niche for itself and judging from some of the activity in the blogosphere the kingdom might not be entirely safe for Gravity just yet. Have a look at the feature by feature comparison on this Google Doc. Helpfull review, thanks. 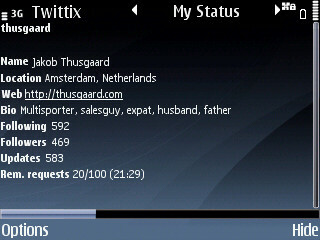 I’m using Gravity on my E71 and I think it’s a great app with almost endless features. One remark; it’s price is high, around E10,-. With Twittix for just E5,- Gravity can loose possible buyers.